TV’s reality shows, particularly the cable variety, are like 19th Century freak shows. They are guilty pleasures where Americans can go to stare, gawk, snicker, be horrified and repulsed, and often feel superior to the weird mutations of the human species that they see exhibited. The phenomenon doesn’t speak well for the purveyors, the audience or the culture, but the it is popular and profitable. Yesteryears’s dog-faced boy is today’s Honey Boo-Boo. Viewers aren’t offended by the awful things the stars say and do..they are entertained by them. Sometimes, sadly, they are inspired by them. 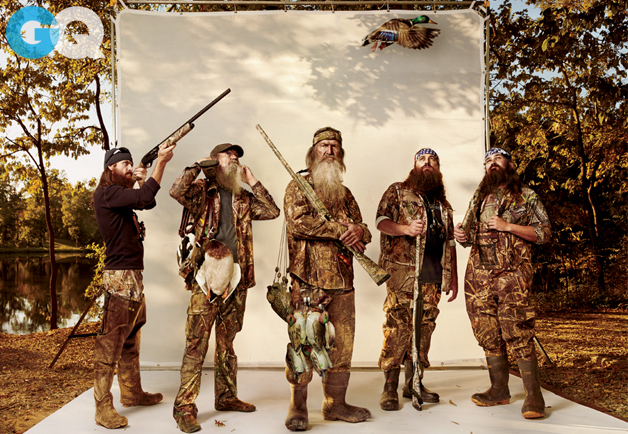 The current hot property in the genre is A&E’s “Duck Dynasty,” the saga of Louisiana’s willfully odd Robertson clan, who have become millionaires through their invention of effective duck calls, wear long beards as trademarks and are proud, God-fearing Christian conservatives of the most primitive variety. Their “Deliverance” lifestyle and profoundly counter-Obama Era attitudes are part of the Robertsons’ “entertainment” package, just as the late Anna Nicole Smith getting carried through her fat, drunk and stupid days by her greedy sycophants and enablers was part of hers. This is reality TV, Americans! Be proud. “Phil Robertson’s remarks are not consistent with the values of our faith communities…” That’s right, they are consistent with the values of Robertson’s faith communities, which have a right to their religious views too. “…or the scientific findings of leading medical organizations.” So what? The guy is a duck hunter, not a college professor and not a researcher, and doesn’t pose as one. If you want to complain, complain to GQ for its choice of interviewees. “We know that being gay is not a choice someone makes, and that to suggest otherwise can be incredibly harmful.” To suggest otherwise is called having a different opinion, which the news media and the traditions of this nation are supposed to encourage. Yeah, I agree that he’s wrong. The way to address that particular misconception is to talk about it, not censor it. “We also know that Americans of faith follow the Golden Rule — treating others with the respect and dignity you’d wish to be treated with.” The Golden Rule suggests that Griffin should allow Phil Robertson to express his opinions just as he allows Griffin to express his. Griffin has no idea, based on Robertson’s remarks, how he treats gays at all. Robertson gave his opinion regarding homosexuality, and millions believe as he does. He can have any belief he chooses and still be in compliance with the Golden Rule, which says nothing about not regarding others as sinners. I think Robertson, for all his faults, probably understands the Golden Rule better than Griffin does. “As a role model on a show that attracts millions of viewers, Phil Robertson has a responsibility to set a positive example for young Americans…” The Robertsons are role models now? Reality show stars are role models? Was the carnival geek a role model? The horrible Kardashians, the eight child exploiting Jon and Kate, pathetic and doomed Anna Nicole, Hulk Hogan, Dog the Bounty Hunter, Flavor Fav, Dennis Rodman, the horrible mothers, coaches and promoters on “Toddlers and Tiaras,” the certified low-life creeps on “Jersey Shore,” the Bridezillas, the desperate hustlers from “Blind Date,” the various disturbing “Real Wives,” TEEN MOM…are role models? Griffin hasn’t watched Robertson’s show—has he even looked at Robertson’s photo?—and has no idea what he’s talking about. Most reality show stars are the opposite of role models—that’s why they are stars. “…not shame and ridicule them because of who they are.” What? Robertson’s family are the ones who are shamed and ridiculed because of who they are, and are PAID to be ridiculed because of who they are—and the interview only provides more ammunition. Again, a crock. Since when does any reality show on any network “represent the views” of that network? Donald Trump is a birther: did anyone assume that this meant that NBC, which broadcasts it (and owns MSNBC! ) is the birther network? TLC broadcast “American Muslim”—did that mean it was an Islamic company? Of course his comments in GQ are his own personal beliefs, and “Duck Dynasty,’ being about Phil and his family, has always been about that family’s beliefs. A&E can decide to dump any employee it chooses if it concludes that the employee, fairly or unfairly, threatens its bottom line. That’s not what’s happening here, though. Obviously the Duck Dynasty clan’s eccentric credo is part of their “charm” (I forced myself to watch an episode before writing this—I will not do so again except at gunpoint); A&E can’t possibly be surprised or disappointed at what Phil believes. It just caved to political correctness, that all: the political and cultural bullies who believe that their point of view not only is the only one, but the only one anyone should be allowed to express without punishment. Any media or arts organization that capitulates to this anti-speech attitude is a disgrace and so hypocritical that it should not be taken seriously. The Constitution’s guarantee of free speech won’t work if anyone being candid in broadcast or print faces the constant threat of an organized effort to have them fired, and nobody is willing to stand up for the open expression of ideas. For there is no evidence that Phil Robertson has ever discriminated against anyone, or been anything other than a model citizen. I’m sure GLAAD doesn’t agree, but what we believe doesn’t make us bad people. What we do does. There are professions where public expressions of such sentiments can’t be tolerated. I have written here about teachers who condemn gays on their blogs: that is disqualifying, just as expressing dislike for women or blacks. A public servant advocating less than full human and citizen’s rights for any group of Americans, or a bias, religion-based or otherwise, against them, does not warrant the public trust. Reality show star, however, is not one of those professions. It is unfair for the broadcasters of a reality show to suddenly express distaste for such a star’s counter-culture conduct, beliefs and attitudes when those are exactly the qualities that network has been profiting from, and created the show to highlight in the first place. Most reality shows are swill, but the swill’s chef should be its defender, and not join the chorus of critics out of rank cowardice, to the detriment of free expression. UPDATE: Well, this is unexpected. Andrew Sullivan, of all people, wrote almost the same post, at about the same time. “PETA wants A&E to do more than suspend one of the characters on Duck Dynasty for damning gays. We call on the channel to challenge the entire crew of duck slayers to ignore Sarah Palin’s self-serving slap on the back for spewing hate speech and deny that they are as anti-gay as they are anti-animal. “All people who consider themselves followers of Christ should follow all His teachings—and that includes showing mercy, compassion, and kindness to all of God’s creation, human and nonhuman alike. Can someone please explain why we aren’t allowed to take members of PETA and recreate “Surviving the Game” with them? With PETA, you have a strong argument indeed. Be sure to get the skin extra crispy — otherwise it will taste like crap. I might also buy a rabbit, skin it, and pan sear it and then oven-roast it with bacon (needs the fat, as rabbit is far too lean – you can actually die from it) and pearl onion. And send the video along with the duck. I really loath those PETA fucks. It is a catholic website. Jack, great write up. I see that the sponsors are starting to speak up and not running away. It looks like with the sponsors in support of family this is going to put A&E in a very difficult position, see if they turn it into a train-wreck. To my great surprise there are gay advocates who have also come out against the suspension and rightly have pointed out that more damage has been to the LGBT cause by the hatred and backlash being expressed from the gay/advocate community, basically what could have been a discussion and teachable moment was lost. Well done to them. Tex, read the link and I think that take seems like it there may be some truth to it.